Yeast sometimes lives within the intestinal environment of the human body and usually causes no problems. But due to various environmental factors it switches to an invasive multicellular form known as candida from a unicellular or yeast form and begins to reproduce very rapidly. As it spreads it builds a biofilm much like h pylori does as a means of protection. These biofilms can range from 25 to 450 µm thick and begin to appear within the first 24 hours of colonization. After 10 years of research, this formula was developed because almost every yeast-eating enzyme formula in the marketplace does not include all the enzymes needed to eat the biofilm. These biofilms are a protective shield that the yeast or bacteria build over themselves as a means of protection. Upon initial colonization they will begin building these biofilms within the first 24 hours, which greatly improves their ability to resist prescription drugs and natural remedies. 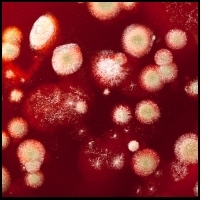 Candida glabrata and candida krusei are two such species of yeast that are highly resistant to Fluconazole because of this biofilm. Fluconazole(Diflucan) does not dissolve the biofilm, instead you have to use one of the Enchinocandins. Once the Enchinocandin gets through the biofilm it then disrupts the cell wall neutralizing the yeast. BioFase does the same exact thing as the Enchinocandins but it is an all natural remedy that is taken by mouth and not by injection. Once you get through the biofilm, natural rememdies are much more effective. Once the enzymes in BioFase get though the bacterial or viral biofilm, the immune system is going to see the infection and mount a response. Why should I take BioFase? Most people that are infected with candida suffer from immune system dysfunction, whether they are aware of it or not. There are over 100 possible yeast infection symptoms that a person with candida may suffer from and many of these symptoms are in the form of diseases caused by the fungi itself. Yeast infections usually start in the intestine and spreads from there into all systems of your body. If left untreated, candida yeast can systematically destroy your health and cause a variety of illnesses. Most people do not know they even have a yeast infection, although it will flair up enough that millions of people every year will have a myriad of symptoms associated with this fungi. 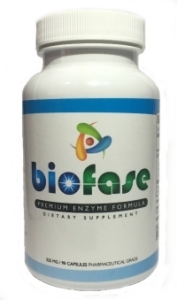 BioFase is a proprietary enzyme formula developed to aggressively eat candida yeast and combat bad bacterial biofilms... safely and effectively! There are well over 100 possible candida infection symptoms that a person with yeast may suffer from and many of these symptoms are in the form of diseases caused by the fungi itself. Yeast infections usually start in the intestine and spreads from there into all systems of your body. If left untreated, candida yeast can systematically destroy your health and cause a variety of illnesses. Most people do not know they even have a yeast infection, although it will flair up enough that millions of people every year will have a myriad of symptoms associated with this fungi. Candida yeast and other fungi produce over 75 known toxins and poisons that can affect the human body. These toxins overload the immune system and can make you more susceptible to life threatening diseases. 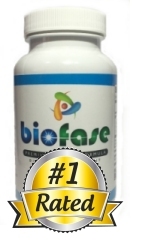 BioFase™ helps target the yeast-producing factory in the intestines, and helps to destroy it. BioFase™ helps to wipe out the systemic form of Candida by eating the tough walls of each yeast cell -- even to the places in the body where probiotics cannot go. BioFase™'s slow release system ensures these enzymes are then able to reach and attack the yeast cells throughout your entire body. Your own body, then destroys the unprotected yeast cells as part of its normal balancing process. Systemic yeast infection and fungal disease do not suffer from a shortage of scientific knowledge, but strangely, the twentieth century has very little information explained to the common person from their doctors on how it relates to common disease and unwellness. Dr. M. G. Rinaldi says, "Given the right immuno-compromised host, virtually any fungus can kill a human being." Clinical Mycology, by C. C. Kibbler, published in 1995, is a compilation of research reports from 18 prominent physicians from universities such as Duke, Stanford, Texas, and others. They talk about the dangers of systemic yeast infection, candida, other fungi, and their related diseases. Chapters include Bone and Joint, Cardiovascular System, Dermatology, Central Nervous System, Gastrointestinal Tract, Ear, Nose and Throat, Respiratory System, and even Ophthalmology. You would think that every doctor in the country would be aware of the risks of yeast and fungus as a cause of many modern diseases. Doug A. Kaufman, with over 30 years of research on fungi and human health, asks these very important questions, "Has medical science really progressed since 1963? Or are 125,000,000 Americans still suffering from unrecognized fungal disorders?" Most of these diseases are of an "unknown" cause? But, when treated with proper diet and a few supplements, in many cases they miraculously go away. Or at least come under control so the person affected can regain some kind of healthy life. Today heart disease and cancer is running rampant, diabetes is turning into an epidemic, and a whole host of new diseases are being discovered seemingly every day. These diseases at the turn of the last century were relatively unknown, but so also were the processed foods and antibiotics. It is the opinion of many natural health practitioners that we all simply need to get back to a healthy diet, much like the truly natural foods that the body was designed to run on. 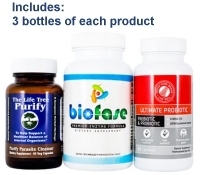 How does BioFase compare to other similar candida cleanse products? Most of the yeast eating enzymes that are in the marketplace contain protein and cellulase eating enzymes to initiate dissolving the cell wall. Alternatively, a couple of the more complete formulas contain added enzymes to also dissolve the polysaccharide carbohydrates. However, NONE of them additionally contain the enzymes needed to eat the fibrinogen and fibronectin component of the biofilm. 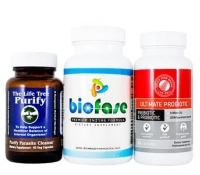 This complete yeast-destroying formulation is what many say that BioFase is truly the BEST natural solution to combat candida and yeast overgrowth. BioFase is the only comprehensive enzyme formula that comprehensively eats ALL of the components of the biofilms and the cell wall of yeast. What ingredients are is in BioFase? One capsule of BioFase contains 525mgs of cellulase and hemicellulase to eat the cellulistic chitinase components of the biofilm and cell wall; invertase, glucoamylase, and amylase to eat the polysaccharide carbohydrates; and protease to eat the polypeptide protein components in the biofilm, cell wall, and nucleus; and most importantly, serratiopepidase(serrapeptase) in ample amounts to eat the fibrinogen and fibronectin part of the biofilm. 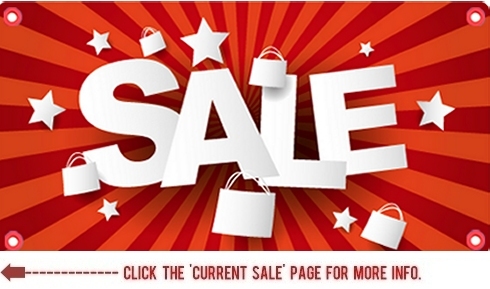 Simply stated... BioFase is the most efficient yeast and bacterial biofilm eating enzyme product on the market. BioFase does not contain egg, dairy, preservatives, salt, sucrose, soy, wheat, yeast, nuts, corn, gluten, potato, rice, artificial colors or flavors. Capsules are 100% Vegetarian composed of water and cellulose. How much of the BioFase supplement do I need to take? Take one capsule in the morning (on an empty stomach), and then 2 capsules in the evening (also on an empty stomach). You can always take more if you choose to (or if directed by your Healthcare Professional). These enzymes have a long history of safety and are not toxic to the body in any way. Want To Maximize Your Candida Cleanse? As a potential major step towards optimal natural health. - Dr. Daniel Jackowiak, ND "Yeast Infection Advisor"
- Michael T. Murray, MD "The Healing Power of Herbs"